On Sale Now! 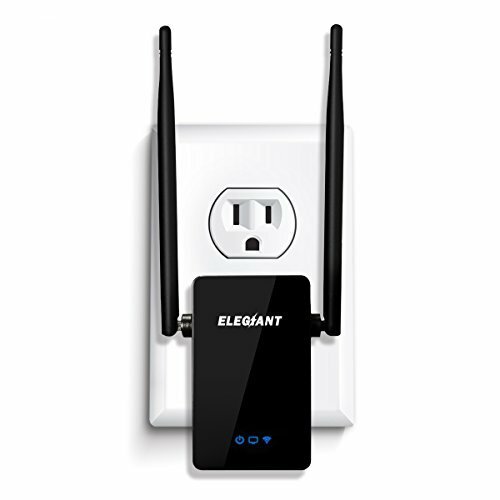 Save 10% on the WiFi Range Extender, ELEGIANT 300Mbps Wireless WiFi Repeater Signal Amplifier Booster Supports Router Mode/Repeater/ Access Point, with High Gain Dual External Antennas and 360 degree WiFi Coverage by ELEGIANT at Pacs BG. MPN: 4328619707. Hurry! Limited time offer. Offer valid only while supplies last. 【Running Speed】: Reliable 2.4GHz wireless network speed up to 300Mbps, farewell to low speed internet, provides you max speed with 300m/s, no more delay for playing game, online transfer files and video chat. 【Coverage Area】: 300Mbps wireless wifi repeater, dual realtek chipset built-in, wall-through wifi extender, 360 degree wifi coverage. Its main function is boost the range of your existing WiFi and create a stronger signal in hard-to-reach areas. Reduce 3G/4G mobile data charges by connecting to wifi at home. 【Product Characteristics】: Easy to install and use, classical design, smart size and wall-mounted design, environmentally friendly design. Low radiation and low power, compatible with nearly all wifi enabled devices like smartphone, tablet, TV etc. 【Built-in Dual Realtek Chipset (RTL8196EU+8192ER)】: Which ensure strong signal from the CPU. It is with dual external 5dBI antenna, it can be going through very well and extend WiFi coverage to long distance.